The path to success in a highly competitive and fast-growing global market is filled with obstacles. The challenge for leaders is to identify, create, and sustain a competitive advantage in a global environment. Strategic Thinking and Leadership — Middle East provides you with grounding in business frameworks to enable you to drive change, moving strategy from concept to reality. 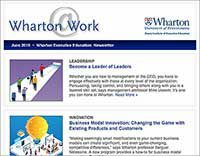 This program reflects Wharton’s deep commitment to global strategy research and will enhance your ability to create and lead strategies that will achieve your organization’s desired outcomes. 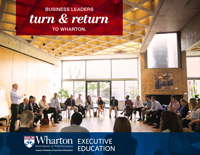 Strategic Thinking and Leadership — Middle East may be attended on its own or as part of Wharton’s Accelerated Development Program (ADP). This certificate program consists of three separate educational experiences and professional assessments, going beyond the classroom to help participants become more reflective and proactive in managing their careers. You will learn to develop and sustain competitive advantage in an increasingly globalized and highly competitive landscape, enhancing the skills you need to lead and execute a strategic plan in your organization. In addition, you will obtain insights into why organizations succeed and fail in global markets, and put new knowledge to the test in a leadership simulation. Strategic Thinking and Leadership — Middle East combines faculty presentations, case analyses, and hands-on exercises. You will examine how other companies have succeeded in highly competitive markets, devise a strategic plan, and build leadership for your own organization by drawing on the best of what Western and Asian research and experience have to offer. High-potential business executives with at least 10 years of work experience and a proven record of advancement are ideal candidates for this program. Executives who are moving into strategic planning or more general management roles may also benefit. Tuition for this program includes lunches, breaks, and program materials, but does not include accommodation. Prices are subject to change.